The SM-56 is an industrial rated high security dial-in/out modem containing one RS-232 serial port, one telephone line V.92 modem port, and one 100BaseT Ethernet port. It may be used as any other simple modem or configured for high security uses. The RS-232 serial port operates at asynchronous speeds from 1200 bps to 115.2 Kbps. The modem may be configured as a high-quality, simple V.92 modem. It may be configured to use one-time pass phrases, the list generated upon request by an administrative user. An AES encrypted connection mode requires a shared key and session key on the modems at both ends of the connection. The connection is secured using the AES encryption algorithm and the modem only connect with other properly configured SM modems containing proper keys. It will disconnect after three invalid login connection attempts or with encryption mode enabled, after a single failure. If the modem detects a denial of service attack, an SOS feature will stop answering dial-in calls temporarily and report to a dial-in pre-configured number such as a numeric pager. Call attempts, call statistics, and management functions are always logged. The 10/100 Ethernet port shares the dial-out modem for locally connected LAN clients that don't have a directly connected modem. This features is accessed with the simple telnet program provided on all PC workstations. It may also be used in reverse as a telnet client for the dial-in user after authentication. 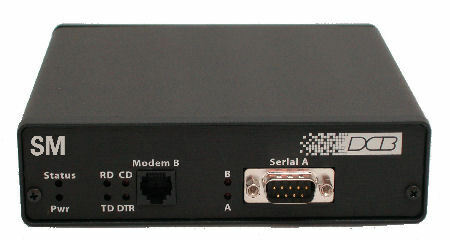 The modem is configured using proprietary AT commands with a telnet connection to the 100BaseT port or directly connected to the RS-232 serial port. A validated administrator must be signed into the modem to perform any management steps remotely. The SM-56 security modem is ideally suited for Critical Infrastructure Protection regulations propagated by the NERC and some FIPS standards. It may be used to meet NERC Cyber Security Standards CIP-005-2 and CIP-005-1 to secure the electronic security perimeter (CPS) around all critical cyber assets. 10/100BaseT half duplex used for dial-in telnet, configuration, or dial-out modem sharing. CIP standards CIP-002 through CIP-009 may be met using standard DCB SCADA products along with proper management and procedural standards. This note delves into CIP standards and shows how the SM security modem helps secure electronic security perimeter access points. 4 1/4" x 5 1/2" x 1 3/4"